The authors of the German Parliament’s resolution on recognition of the Armenian Genocide are confident that this time the bill will be adopted. Some also believe that the passage of the resolution is first of all necessary for Germany, which was an ally of Ottoman Turkey during World War I. The resolution officially describing the mass killings and deportations of Armenians under the Ottoman Empire’s rule as genocide is expected to be put to a vote in the Bundestag on June 2. But the Turkish government has already warned Germany against taking the step. The German lawmakers who have authored the legislation have been in Armenia these days. During their visit they also traveled to Nagorno Karabakh, which saw an aggression from Turkey’s regional ally, Azerbaijan, last month. At a press conference in Yerevan on Thursday, Bundestag member Ulla Jelpke, a co-author of the bill, said she thinks it is important that the resolution should also mention Germany’s responsibility. “We want the German public to know that once Germany sent soldiers and generals to the Ottoman Empire and Germany had its participation in the perpetration of the genocide,” the lawmaker said. 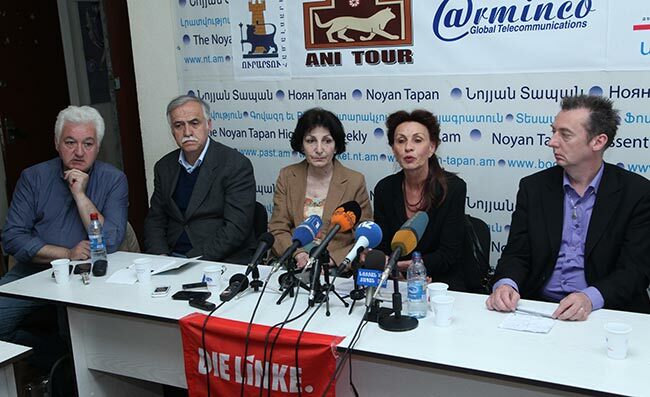 Director of the International Secretariat of the Armenian Revolutionary Federation (ARF) Bureau in Yerevan Giro Manoyan also thinks that the adoption of the new resolution is very important for Germany. “It was not right for Germany, a nation that itself committed a genocide, to try to steer clear of recognition by its 2005 decision, saying that it was a genocide, according to experts. I think that Germany has matured enough time to call things by their proper names, and there are different political parties that are actively working on this. Still last year, this resolution was put into circulation by their Parliament, but for some political calculations it was not passed. I think that this year it will be done, after all,” Manoyan said. According to the ARF representative, for Armenia the adoption of this resolution is important also because Germany is a very influential country in the world. “The passage of such a resolution by a country with such a large Turkish community will be a very important message for the whole world, which will contribute to the process of the international recognition, condemnation and eventually compensation for the Genocide,” Manoyan concluded.